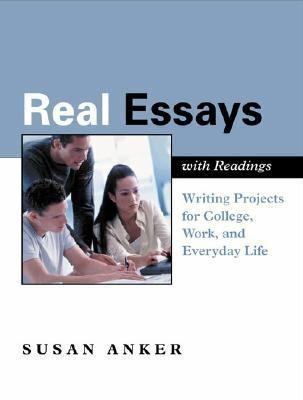 Written by the author of the remarkably successful "Real Writing, Real Essays" strengthens the writing and editing skills that students need to succeed in college, at work, and in everyday life. Maintaining a strong connection to the real world, the second edition does more to build the skills that are essential for success in the essay-writing course and for other college-level work. Expanded coverage of close, critical reading and new advice and assignments on writing about readings give students practical preparation for college success.Anker, Susan is the author of 'Real Essays With Readings Writing Projects for College, Work, and Everyday Life' with ISBN 9780312399153 and ISBN 0312399154. Loading marketplace prices 6 copies from $1.73 How does the rental process work?